What have I been hired to do? What results are expected of me? What can I do to make a real difference in the organisation’s fortunes? What are my bosses’ Critical Result Areas? What Critical Result Areas should be for my sub-ordinates? What do I want to achieve - my goals: Long term? Short-term? Professionally? Socially? long term planning: self development outlook. 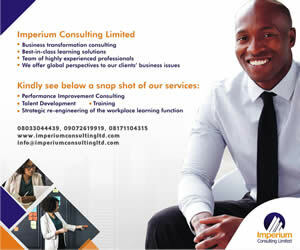 Application of competence to see jobs delivered cost effectively. Review self performance against set goals. Create new ways of doing things that are beneficial, advantageous or profitable. Respond resourcefully to new demands or circumstances. Develop new thinking and skills and challenge yourself. Take on difficult tasks in order to achieve business results. Structure process for quality and efficiency. Strive for learning and growth both professionally and personally.